In the summer of 2003, a sleigh dog was found by the gates of Mystery Mountain ski hill. Her nose was torn and busted with her ribs clearly showing through her skin, she was in obvious need of care. Residents from Thompson, who traveled on the road, started to leave food for the skittish animal. After a few weeks local Thompsonites, Oswald Sawh and Denise Earle, brought the dog to Thompson and tried to secure a home for her. The dog was named Mystery due to her unknown origin and at the place she was found. Mystery, still very afraid, made many escapes from various foster families. In order to provide a secure place for her as well as to highlight the abuse done to her to teach others, Mystery was housed in the Thompson Zoo for two months. Individuals started to give cash towards the cause that she was now starting to represent. In the mean time she was slowly socialized. 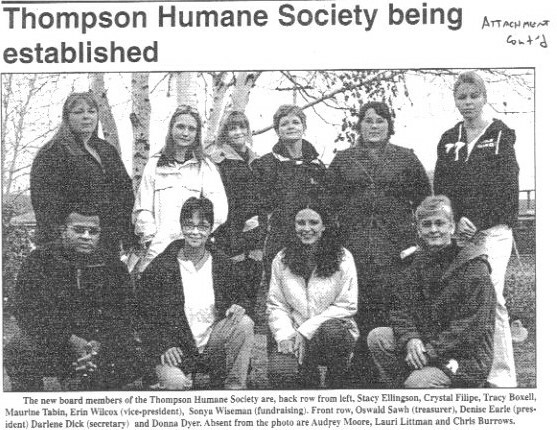 It was during this time period that these individuals, along with the Zoo Manager Erin Wilcox, recognized the need for a Humane Society in Thompson. 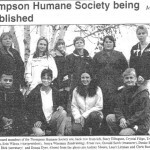 In November of 2003, the Thompson Humane Society (THS) was formally created. The THS operated without a building until June of 2006. 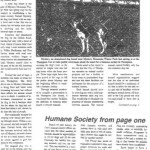 During this time, as funds were being raised to purchase a building from a local pet store, the THS operated foster care and adoption programs. Animals were kept by members of the Board and dedicated volunteers. 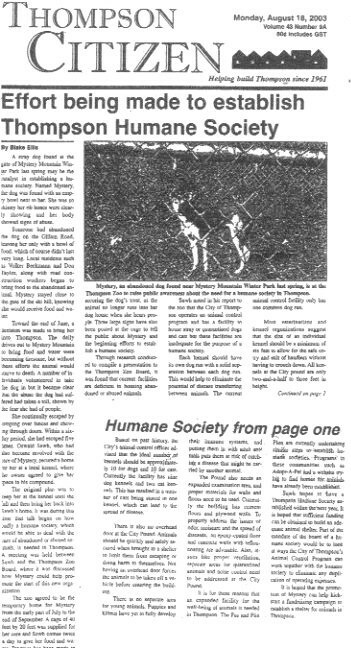 The THS also met with the City of Thompson in order to secure a partnership that would result in the Animal Pound, in the opinion of many a substandard animal holding facility, being closed and all animals (under both the Animal Control Program and the Humane Society) being held and cared for in one location. The Animal Shelter was officially opened in November of 2006. 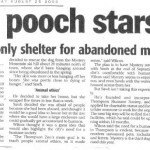 To most, the building represents a safe haven for dogs and cats that are lost, abandoned and/or abused. To some, it represents a mission that was started many years ago by the dog that showed a community the effects of cruelty to animals. Mystery has been, and still continues be a rallying point for members of our organization as the THS continuous to try and make a difference, not only in Thompson, but in the region. Our message is quite simple – a dog, a cat, any animal feels pain, they need food, water and shelter…like we all do. The mission of the THS is to promote this message, to educate and to provide a safe haven for the animals in our care. In this way, the THS hopes to encourage compassion towards all life.